Lake Country Thin Foamed Wool Pads combine the proven durability and immense cut of the thicker style Lake Country Foamed Wool Pads in a new, 1/4 inch thickness.� This makes the Thin Foamed Wool Pads a better choice for conventional dual action polishers that feature a free-floating spindle bearing assembly, like the Porter Cable 7424xp, Meguiars G110v2, Griot�s Garage 6 Inch Random Orbital DA and the Shurhold Dual Action Polisher.� If your goal is to remove heavy swirls and water spots, Lake Country Thin Foamed Wool Pads are for you! The secret to the superb cutting and finishing ability of the Thin Foamed Wool Pads is a fusion of foam and wool known as nanofoam.� Nanofoam particles encapsulate the base of the wool fibers to help prevent caking and matting.� This enables Lake Country Thin Foamed Wool Pads to cut like a wool pad but finish like a foam pad, giving you the benefits of both a foam and a wool pad � in one! Short fibers The advantage of a shorter, � in pile is less rotational mass.� Conventional dual action polishers, like the Porter Cable 7424xp, are not designed to provide the power necessary to rotate a full-size wool pad.� If the pad isn�t rotating, the swirls, water spots and scratches will not be removed.��Thanks to the thin, � inch pile of the Thin Foamed Wool Pads, you�ll be able to remove heavy swirls, water spots, oxidation and scratches with your dual action polisher. Nanofoam particles Lake Country�s Foamed Wool is a patented process whereby microscopic polyfoam particles encapsulate the base of the wool pad. You can feel how the wool is tighter and denser than a regular wool pad. This enables the Thin Foamed Wool Pads to better withstand the stress of polishing with less caking and matting, providing more consistent results. The Foamed Wool encapsulation process locks the lambswool fibers in place to significantly reduce linting. 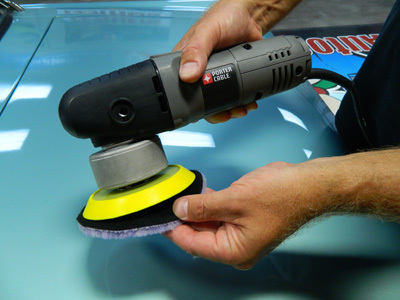 The paint surface will stay cleaner as you work with less to clean up when you�re finished detailing. Durability Lake Country Foamed Wool Pads have proven themselves as being one of the most durable buffing pads available.� Lake Country Thin Foamed Wool Pads are no different.��These pads can be used, abused, washed and reused, making them one of the smartest investments in paint polishing material.� If you�re a professional detailer that offers paint correction services, Lake Country Thin Foamed Wool Pads will quickly become a staple in your arsenal of detailing supplies. Versatility Lake Country Thin Foamed Wool Pads can be used on paint systems with varying levels of hardness or softness.� Whether you�re working on rock-hard German paint or super-soft Japanese paint, rest assured the Thin Foamed Wool Pad will cut out the defects without scouring or dulling the finish.� What more could you ask for in a wool pad? Applications Lake Country Thin Foamed Wool Pads were primarily designed for dual action polishers, but they perform exceptionally well on rotary polishers as well.� Use Lake Country Thin Foamed Wool Pads on paint, glass, metal and gel coat.